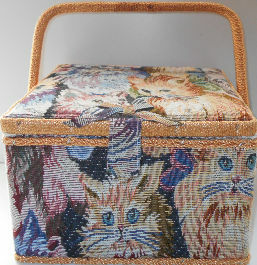 Here is a sewing basket decorated with cat fabric. The particle board and wood sewing basket is 10" wide x 10" deep x 6" high. Previously owned. Only visible defect is that the velcro closure flap at the front does not "stick". Otherwise in good condition.